In 1928 Dr. William Marston (Harvard University) wrote “The Emotions of Normal People” and in here he theorised that people are motivated by four intrinsic drives that direct behavioural patterns. He used four descriptive characteristics for behavioural tendencies which are represented by four letters of the alphabet: D, I, S and C. Thus, the concept of “DISC” was introduced. Slower Paced end, they tend to be more cautious and engage their motors in a controlled manner. The second axis in on the vertical with one end being Task Orientated and the other People Orientated. You can think of this as their external focus or priority. On the Task Orientate end one people tend to be focused on getting the task done, whilst on the People Orientated end they tend to be more tuned in to the needs of people. The purpose of the DISC ADVANCED ® system is to provide you with a simple key to understanding how people behave. I do want to emphasize that the DISC model is not a personality test like MBTI or the Facet5. It’s a tool to help us understand our preferred behavioural tendencies, both natural and adjusted. 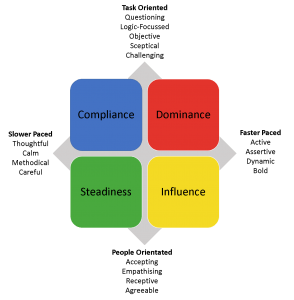 I have used the DISC ADVANCED ® to help team members better understand how each other prefers to operate and communicate and how to leverage off everyone’s inherent strengths. With leaders, I have found this to be a great way for them to develop a greater self-awareness around how they prefer to operate, then exploring the implications of them prefer style within their team. Finally, using the DISC ADVANCED ® system with businesses, I have not only help them develop a greater understanding of their most important asset, their staff, but how a business can adapt the approach to meet the different styles of each customers. "I was initially a little skeptical about using the instrument, but I found it extremely accurate and insightful. This will help me to understand myself and my team better"
Whilst the DISC ADVANCED ® is extremely useful in assisting developing self-awareness and ongoing personal development, it not designed to put you in a box or label you a D or and I. The instrument provides you with a cue print for how you are likely top behave under normal circumstances, not a blueprint for life. After all every single one of us is a unique experiment never been tried before and will never be tried again. If you are interested in learning more about how the DISC Advanced System can help you and your team please contact me today. I would be more than happy to share with you my experience using the instrument to help people become the best that they can become. For more information contact us on 07 4772 3800 or email [email protected].